Jerry Springer: The Opera came to Leicester's De Montfort Hall for the week 27 February - 4 March 2006, and was welcomed by the Society on the Monday with a large demonstration, alongside a smaller group of religious protesters. This is how it was shown in the Leicester Mercury. It was later discovered that the protsters holding the placards with crosses were connected with the British National Party, since the same placards had been seen outside the court in Leeds where two BNP members were involved in a court case recently. People for and against Jerry Springer: The Opera staged demonstrations to mark the musical's arrival in Leicester. Crowds of up to 60 protesters gathered outside De Montfort Hall with banners and placards to air their views on the controversial show. About half sang hymns, prayed and handed out leaflets to theatre-goers. The rest - members of Leicester Secular Society - distributed flyers in support of the opera and put up a large banner stating: "We Love Free Speech". Inside the venue, an audience of just under 1,000 whooped and cheered throughout the performance before finishing with a raucous ovation. City council culture spokesman John Mugglestone - who previously said he hoped the musical would play to empty houses every night - was in the audience. Afterwards, Coun Mugglestone dismissed the production as "a load of rubbish". Protesters have pledged to return as the production continues for the rest of this week. They say the producers' depiction of a "slightly gay" Jesus Christ is blasphemous, and object to the extensive use of bad language. Wayne McDermott, 31, a Christian from Coalville, carried a placard stating "Defend Christian Values". He said: "I have read reports about the musical and it is blasphemous. I wanted to come and show my opposition. We are very concerned that this kind of thing is allowed to be shown." Susan Keats, 62, a churchgoer from Countesthorpe, said: "I have seen the show and it's obscene. They wouldn't allow this kind of thing against any other religion." Secular Society member Keith Baker, 27, from Leicester's West End, said: "With all the fuss in the papers, we thought it was about time we came along and gave our support for the show. Freedom of speech is more under threat than it has been in 30 years with opposition to this kind of thing. "This show has every right to go ahead. If people don't like it, they don't have to go and watch it." Coun Mugglestone said: "It was a load of rubbish. "I wasn't offended, because I've got skin like a rhino, but I can see how easy it would be for other people to get offended and I don't think it's the kind of thing that the city council should put on." Before coming to Leicester, the show toured Plymouth and Birmingham. Both venues attracted protests from Christian groups. A spokesman for producer Avalon hailed Leicester's opening night a success. He said: "It's gone very well and we have had getting on for 1,000 people in the theatre. We are delighted that the show was very well received and the protests were kept peaceful. "It is interesting to see people are now protesting for the rights to free speech." 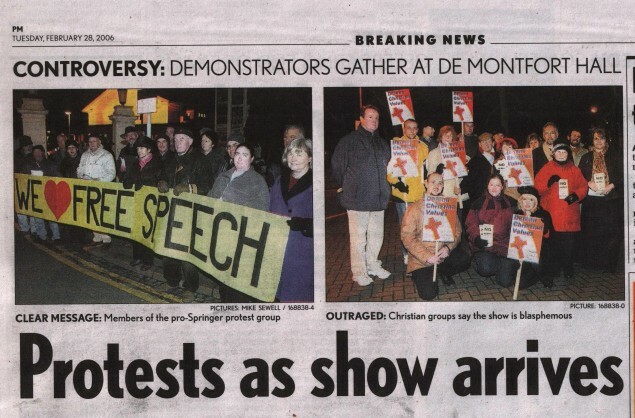 On Tuesday Feb 27th, at the opening night of 'Jerry Springer the Opera' at De Montfort Hall, over 30 members and supporters of Leicester Secular Society turned out to express their pleasure that the show had gone on, despite a campaign against it by religious fundamentalists. 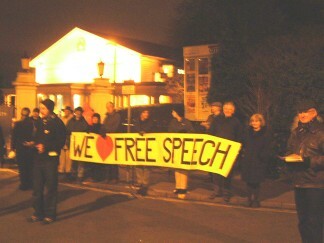 They handed out leaflets welcoming audience and cast to the show in front of a banner reading 'We love free speech'. Secular Society member Chris Williams said: "Before last night, media attention was focused on the small self-styled Christian Voice and its threats to picket the show. We felt that it was important that some organisation in the city should take the lead in speaking up for essential freedoms." "We talked with some of the Christian Voice demonstrators - they were there simply because they had read or been told that the show was blasphemous - they had no idea of what it was really about." "This sort of thing, and faith schools, are waking people up to the dangers we are facing - our membership is going up steadily. We are continuing the work for which the society was founded in 1851. Lots of battles that we thought were won decades ago may need to be re-fought." Allan Hayes noted: "Two items, copied from Leicester Mercury on the Saturday before the show started are from Christians who are in tune with our position. Of course we will disagree over some points and interpretations, but I think that we should welcome this and invite discussion." I am a Christian who believes that it is right for Jerry Springer: The Opera to be shown. I am going to see the live performance, having already watched it on TV. One should not condemn without seeing and this production actually embodies an important Christian truth: Jesus, the Christ, came for everyone and represents everyone - including trailer trash who like watching pole dancing and the likes of Jerry Springer. As to disrespect for Jesus, in the production, He wears a loincloth, not a nappy, and appears as He would have on the cross. The actor playing Him resembles Michelangelo's depiction of Christ in Judgement on the wall of the Sistine Chapel. Disrespectful the opera may be, yet it needs to be seen for the same reason that the cartoons of Mohammed need to be seen. Those who follow a religion must be prepared to justify their faith and show by their actions that they follow it. Jesus said "turn the other cheek", a lesson that could be well learned by Muslims demonstrating against a set of cartoons which are mainly book illustrations, and quite innocuous. If they cannot accept criticism of their faith without going out and demanding that people of other faiths and none, should be killed, then they need to be ridiculed. They should look carefully at the reasons behind the publication of the cartoons, as Christians should look carefully at the reasons for the production of Jerry Springer: The Opera. And yes, there is a blasphemy in the opera, but I have never heard anyone point it out. Jerry Springer finally rolls into town - not the trashy, cheap American TV show, but the opera which brilliantly and mercilessly satirises it. Few theatrical events in recent years have caused such controversy. But if Leicester aspires to be a cultural centre, it must allow its citizens to see such award-winning shows, and to make up their own minds. Let's be clear. The opera does not directly attack Christianity. God only appears when the deranged Springer faces the ultimate horror of having to referee a showdown between God and Satan. But it does reduce religious figureheads to the level of the humans who inhabit the strange world of reality television. Christianity has been sent up before - there was an outcry when Monty Python's Life of Brian was first screened, and the Simpsons frequently caricatures the Church. It isn't the only faith to be so treated, though a largely secular Britain is generally less sensitive to jokes about religion than Muslims have been about the Danish cartoons. Springer is an enervating, live theatrical experience, something not captured by the television version. Audience participation is encouraged. It is very funny, but doesn't appeal to everyone because of its abusive language, its operatic music, or because it is even more nauseous than the original. But its moral is clear. Purveyors of TV trash and their like get tormented in hell. In one sense the controversy is about free speech, and where that hard-won right ends and lack of respect for personal, racial and religious sensibilities begins. This applies to both sides. Forcing a controversial play off the stage, as Sikh protesters did in Birmingham, runs the risk of being as contentious as the play itself. Voltaire famously declared: "I disapprove of what you say, but will defend to the death your right to say it." Yet in Voltaire's time, criticism of authority was explicit and crude. Caricaturists like James Gillray pilloried royalty and religion with impunity, and John Gay's Beggar's Opera attacking Robert Walpole was the Jerry Springer opera of its age. So Jerry Springer: The Opera follows a long tradition of satire in print, on stage, film and television. Satirists still patrol the boundaries of good taste. The acid test is surely humour. Does it point up an inherent truth and make you smile? Or does it simply hurt or insult? Go and see this show for yourself - but go with an open mind - and you may be surprised. Protest if you must, but above all thank your god that in this country we live in a society where for the most part tolerance, respect and sound common sense prevail. * David Johnson is a practising Christian and has seen the show twice. He is Fellow at the School of Historical Studies, Leicester University.